Woodsman 2nd Series Match Target .22LR 4.5" Blue, 99.7% / ANNB, SN#142667-S (1955) with mint correct original brown injection molded plastic grips w/thumbrest, mint bore, correct magazine, Xerox 'Flattop' instruction sheet, no test target, both grip adapters, no box. 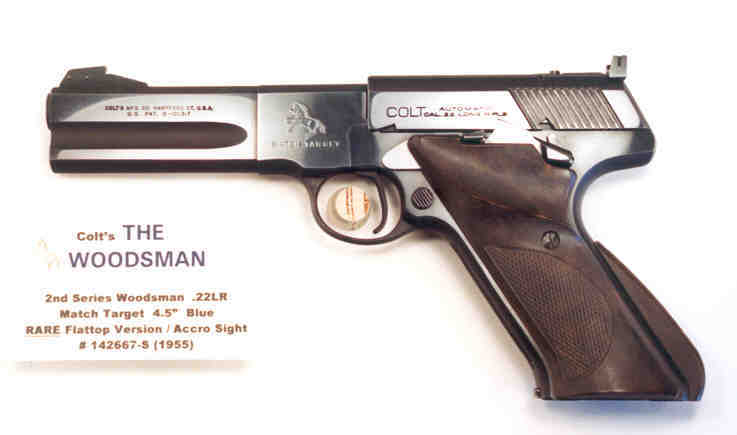 Gun features the new-in-1953 Accro rear sight with 'Flattop' slide -- these 'Flattop' models were produced from mid-1953 to end of production of the 2nd Series guns in 1955 and are much scarcer and harder to find than the earlier Coltmaster rear sight models because Colt's was making very few Woodsmans at the time. Gun is strikingly MINT with the exception of some very miniscule light freckling on the right side (not all over right side) which is NOT the display side -- display side is 100%!